When the cannons roar, the muses stay silent (but the hacktivists hack). As we reported last week, operation “Protective Edge” instigated a flurry of activity by Muslim hacktivists, targeting Israel. In the following post we will review the activities which took place so far and try to characterize them. Attackers can by divided into three types: individuals, hacktivist groups and cyber terror organizations. Individuals usually join larger campaigns by hacktivists groups and show their support on social media sites. Hacktivist groups taking a stance make extensive use of Facebook as a “command and control” platform. 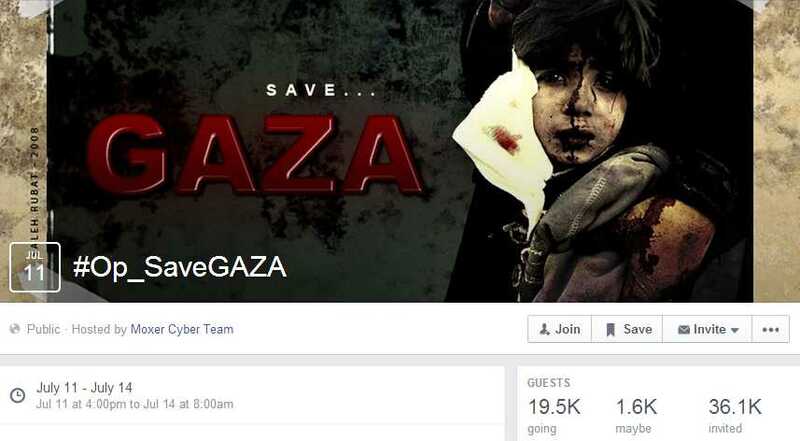 The largest “event” dubbed #OpSaveGaza was created by Moxer Cyber Team, a relatively new group who probably originated from Indonesia whose event page has 19,000 followers. The event included many lesser known Islamic groups, mainly from Indonesia, who did not participate in previous campaigns against Israel. 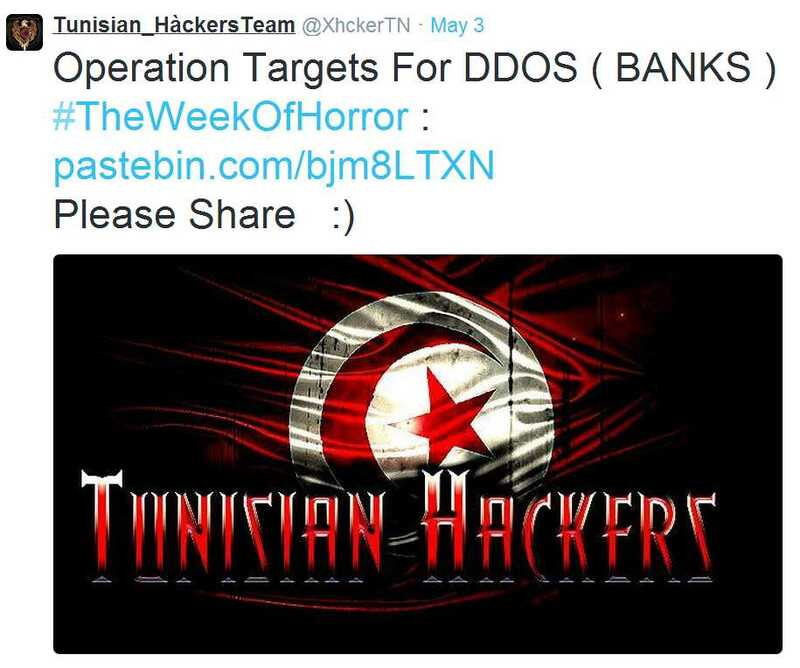 Another event page by the Tunisian AnonGhost announced that the attack will include 38 groups from around the Muslim world. The campaign is planned to continue until the 14th of July. 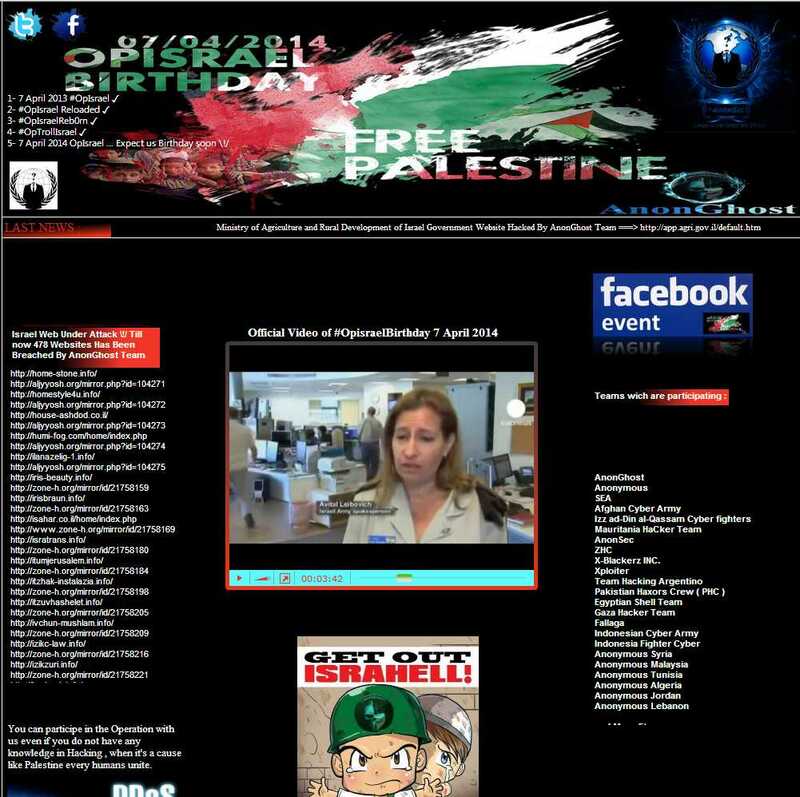 Cyber terror organization in the form of the SEA (Syrian Electronic Army and ICR (Islamic Cyber Resistance) have not officially declared their participation in the campaign but have waged several high profile attacks, such as hacking into the IDF spokesman blog and Twitter account (SEA) and leaking a large database of job seekers (ICR). The participants in this campaign use similar tools as previous campaigns – Generic DDoS tools, SQLi tools, shells and IP anonymization tools. 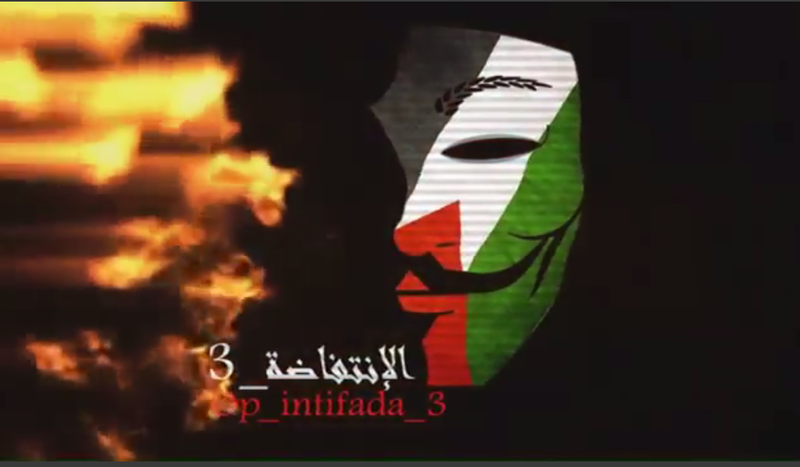 #OpSaveGaza campaign included to date mainly defacement attacks (about 500 sites have been defaced), DDoS attacks of minor scale and some data dumps. Two interesting trend we’re seeing are recycling older data dumps and claiming it to be a new one, and posting publicly available information which was allegedly breached. We estimate that these activities will continue until the hostilities on the ground subside, with perhaps more substantial denial of service or data leak attempts. For the past few weeks, members of Anonymous and supporters of ISIS have been battling each other over the social media networks. 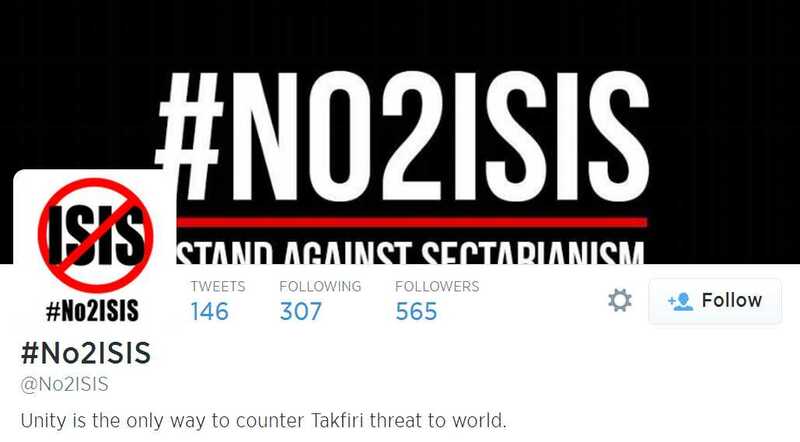 First, several Twitter accounts were created under the hashtag #No2ISIS to protest against ISIS activity in Iraq. Then, on June 21, 2014, an Anonymous-affiliated group called TheAnonMessage uploaded a public press release via YouTube about a cyber-attack targeting countries that support ISIS, such as Saudi Arabia, Qatar and Turkey. 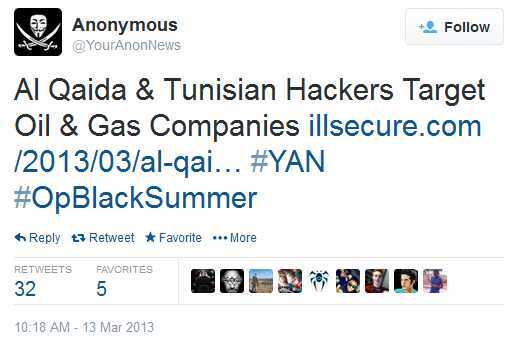 On July 1, 2014, the Twitter account @TheAnonMessenger tweeted that the #No2ISIS cyber operation would continue until Anonymous decided otherwise. 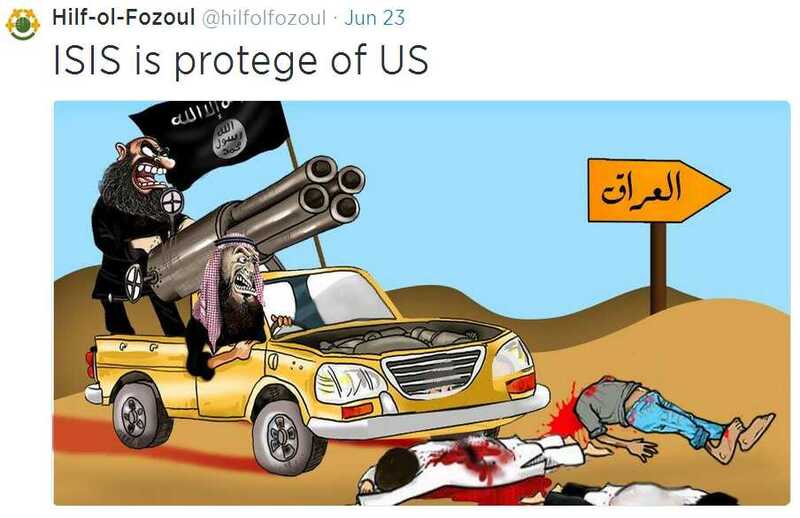 The pro-Islamic Hilf-ol-Fozoul Twitter account also accused ISIS of being a protégé of the U.S.
Contrastingly, several Muslim hackers that support ISIS responded to the Anonymous declarations by adding the hashtag #OpAnonymous to their tweets. 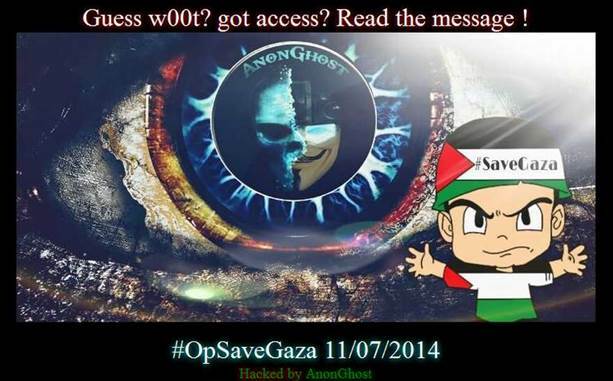 To boot, a very active hacker nicknamed Kjfido tweeted this message to Anonymous members. Kjfido presents himself as a cyber-jihadist and an official member of the ISIS Electronic Army.It should be mentioned that there is no evidence that the ISIS Electronic Army actually exists, although there is a Twitter account by the name @electonic_ISIS that tweets about ISIS activity and its agenda. 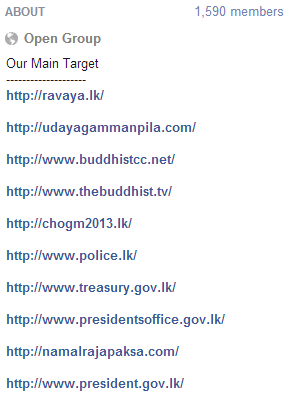 Over the last few days, several Muslim hacker groups have hacked government and financial websites in Sri Lanka in protest against the government’s attitude toward the violent clashes between Buddhists and Muslims. As you can see in the graph below, there were hundreds of tweets over the weekend with the related hashtag #OpSriLanka. For example, one Twitter account named Global Revolution called for the hacking of the Sri Lanka central bank website. There is also a group page on Facebook named #OpSriLanka with 1,590 members. The main targets of the group are Sri Lankan government websites and official websites of the Buddhist population in Sri Lanka. The attack tools are mostly DDoS tools for computers and Android phones. Additionally, on June 22, 2014, a group of hackers nicknamed Izzah Hackers leaked Sri Lankan government emails and passwords via Pastebin. Sri Lanka is not alone. Muslim hacker groups are responsible for previous cyber-attacks against Myanmar (Burma) and the Central African Republic (CAR), protesting the killing of Muslims on religious grounds. 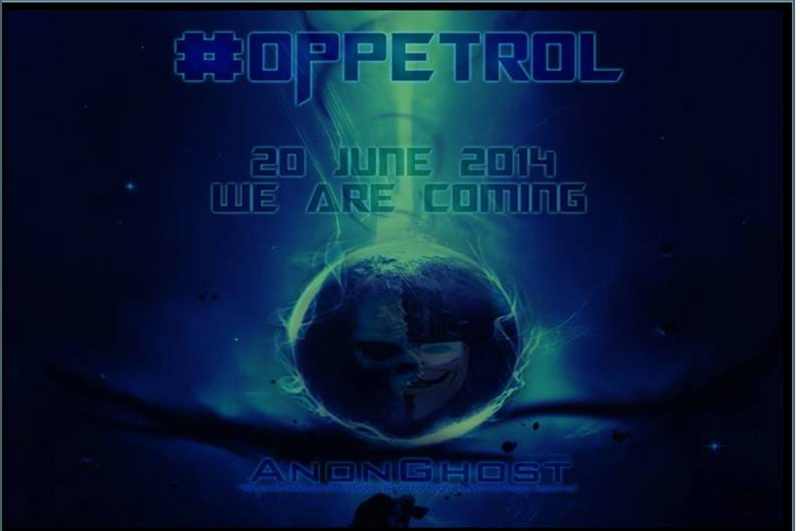 Hacktivist collective Anonymous announced a cyber campaign called #OpPetrol, planned to be executed on June 20th, 2014. This is a re-run of a similar campaign with an identical name which was launched at the same exact date last year, aimed at the international oil and gas industry at various geographies. 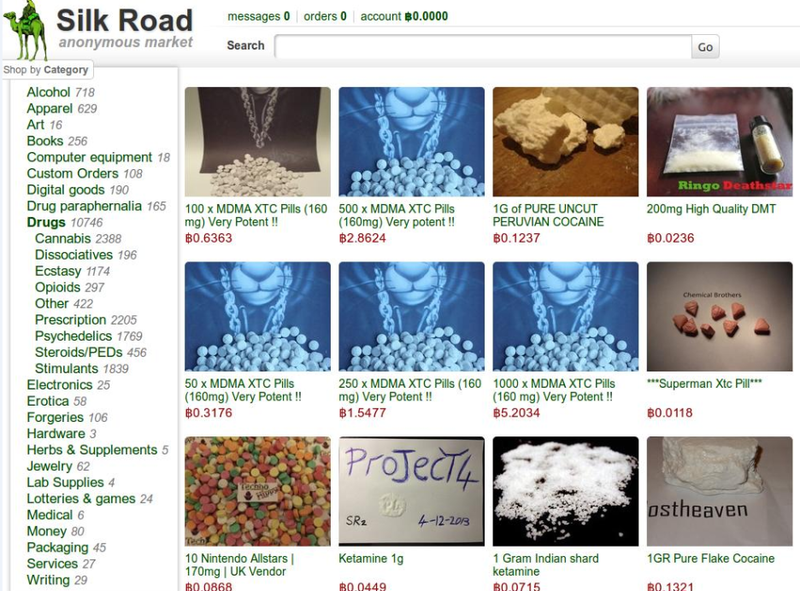 The most prominent group seems to be AnonGhost that recently defaced hundreds of websites and leaked a large amount of credit cards details. In addition, specific Oil and Gas companies in various locations, from the Gulf to Norway are on the target list. Last year’s campaign did not cause any substantial damage and we assume this re-run will achieve similar results. On May 12, 2014, an AnonGhost member and developer of the new AnonGhost DDoS tool, nicknamed Ali KM, created an event page on Facebook announcing a cyber-campaign against FIFA websites. #OpFIFA will take place between June 10 and 12, 2014. It is worth mentioning that already in January 2014, hacktivists had created event pages on Facebook threatening to carry out cyberattacks against websites affiliated with the Brazilian Government (hosting the games) and FIFA. According to Ali KM, the main reason for the #OpFIFA campaign is what they consider FIFA’s humiliating attitude towards Muslim teams. Thus far, approximately 100 Facebook users have joined the event and over 1,000 users have been invited. Ali KM has promised that if the participants wage successful DDoS attacks against FIFA websites, he will provide them with free HD live streaming from his own servers during the World Cup games. In a related matter, according to cyber security researchers, hackers use FIFA World Cup games to spread different malware. For example, a new backdoor was discovered in a file called Jsc Sport Live + Brazil World Cup 2014 HD.rar. The archive contains an executable file that creates a remote access, allowing hackers to gain full control of the victim’s computer. Hackers also spread a claimed key generator for cracking football games that actually run an adware on the victim’s computer. World Cup games are also a useful platform for phishing attempts, such as the one spotted last year, claiming to provide a promotional offer for FIFA World Cup 2014, but which actually tried to steal credit card credentials and personal details of the victims. Security researchers recommend ignoring such links and files and keeping antivirus updated. Have a great and malware-free World Cup!